*Denotes a charter Zontian who is still a current member of the Zonta Club of Christchurch South. Initial meetings were held at the University Staff Club. Since 1981, meeting venues have included Heatherlea, Elizabeth House, the Cotswold Inn, Latimer Lodge, the Canterbury Club and the Russley Golf Course Club Rooms. We hold eleven meetings per year, usually featuring an interesting speaker. We produce a monthly letter emailed to members and run a club website/Facebook page. Within the club, we have service, membership, programme and status of women/international committees. In addition, we have a committee that organises our annual Young Sports Person of the Year Awards. Members are regularly kept aware of local and International Zonta-related advocacy issues and informed about Zonta International and ZISVAW projects by the Status of Women/ International Committee. All c lub service projects are considered for their relevance to enhancing the status of women and Zonta’s biennial objectives. 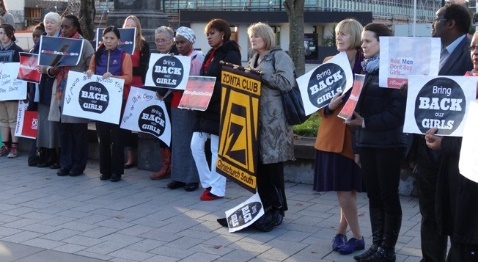 A club representative regularly attends local National Council of Women meetings. The club frequently makes submissions, often through District 16, and sometimes directly, to government agencies, about issues affecting women , such as trafficking of women and girls and the closure of the Salisbury School for Girls. 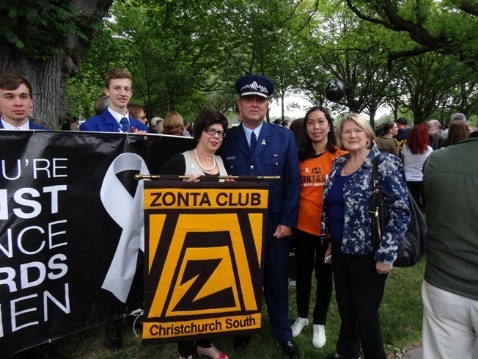 [read more=”Read more” less=”Hide”]Christchurch South Zontians have also been involved with projects to support Zonta’s Say No to Violence campaign, including the production of bumper stickers, and support for White Ribbon breakfasts and for Aviva Women’s Refuge. Members have also demonstrated Zontian support for international issues such as the situation of women in Zimbabwe, and the release of the schoolgirls kidnapped in North Eastern Nigeria. We have annual involvement with the UN Women breakfast and, in both 2014, when Sue Kedgely was guest speaker, and in 2015, took responsibility for its organisation. In March 2015, Lieutenant Colonel Emma Thomas, Commanding Officer and Sergeant Major Alie Henry, Regimental Sergeant Major, Burnham, the first all-female Command team in the New Zealand Defence Force, were our speakers. Early major projects included an annual fashion parade and an annual art exhibition, the latter initiated in 1981 from an idea put forward by foundation club member, Margaret Watling. Both of these projects ran for a number of years. In December 1991, after much input from member, Beverley Hair , the club initiated the Quinn’s Young Sportswoman of the Year Awards. Over the past 25 years, this has developed into the annual Sportsperson of the Year Awards, a prestigious occasion, with both male and female entrants from secondary schools throughout Canterbury. In 2013, 130+ entries were received, the highest number to date submitted. [read more=”Read more” less=”Hide”]A small sampling of other c lub service and fundraising projects over the years has included funding a foetal scalp monitor for the Christchurch Women’s Hospital, blank tapes for the Talking Book service for the disabled, distributing Life Tubes to local pharmacists, a suitcase packing demonstration for travellers, a breast self-examination day, Jo Seagar cooking demonstrations, degustation dinners, mock interviews to assist secondary students with job-seeking, international concerts and meals, production and sale of our own hand cream, and an annual trailer sale at Riccarton Market. In 1985, the club established its annually awarded Founders’ Day Scholarship for a female student from local schools attending Lincoln University for her first year study. After coming across the idea at the Zonta International Convention in Melbourne, since 2005, the club has produced breast cushions for women undergoing treatment for breast cancer, distributed through the local Cancer Society. Christchurch South estimates that it has so far manufactured and distributed 2500 breast cushions. Christchurch Hospital (breast cushions) Southern Cross Hospital (breast cushions) Women’s Refuge-GP services for clients. * Denotes a small donation in lieu of speakers’ fees. Christchurch South frequently combines with other local Zonta Clubs to work together on projects to enhance the empowerment of women. Combined club activities have included funding a dialysis vehicle for the Kidney Foundation, two celebrity debates to establish the annually-awarded Zonta International Canterbury Tertiary Scholarships, a combined Zonta donation of $5000 to the Kate Sheppard National Memorial Appeal (1992) [read more=”Read more” less=”Hide”]celebrating the centennial of women’s suffrage in New Zealand, the Combined Zonta Clubs’ Environmental Project at the Styx Wetland in association with the Christchurch City Council, the Celia Lashlie book launch at the Jade Development Centre (2002) and the Zonta Combined Scholarships’ dinner to raise funds for the Endometriosis Foundation (2009). In 1988, Glen Price and Ann Skilling began organising a new club in Timaru as a service project of the Zonta Club of South West Christchurch Area, with the new Zonta Club of Timaru holding its charter dinner on July 5th 1989. On November 17th 1993, the charter dinner for the Zonta Club of Ashburton took place, attended by Glen Price as Chair of the Interclub SOM committee. Anne McMurtrie and other club members were also involved with the formation of the Zonta Club of Christchurch East. The club has enthusiastically supported all District projects, including Teen Parent Schools, the ME Programme administered by the Endometriosis Foundation, Women’s Refuge, the New Zealand Gynaecological Cancer Foundation and, currently, the Sophie Elliott Foundation. Through a connection with Christchurch South Zontian, Anne Trappitt, a relationship was formed between Zonta and the Heart Foundation for its Go Red for Women campaign. Club members participate in all District conferences, Area w orkshops and forums, with some attending Zonta International conventions. 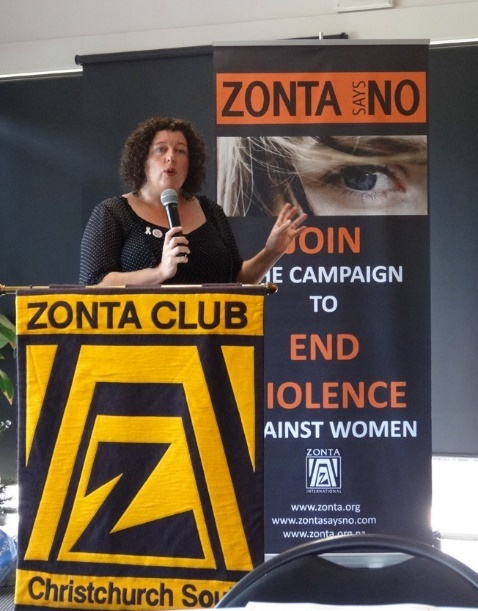 In 2012, in a true example of Zontian sisterhood, the combined Zonta clubs of Auckland came to the assistance of Christchurch Zonta clubs, then implementing planning for the District 16 Conference in Christchurch, by organising and hosting the Christchurch District Conference in Auckland. It had become obvious that on-going earthquake after-shocks and a shortage of accommodation would make it impractical to host the conference in Christchurch. The 2017 District Conference is again scheduled to be held in Christchurch. Compiled by Historian: Jennifer Loughton (District Historian), Marilou Crequer, Sue Clark and others.